2015 I WRAPS I 45 A s an independent graphics installer, I am fortunate to work with graphics manufacturers around the country to install their projects. In this capacity, I am also able to gain a perspective on graphic trends nationwide—to see which materials are being used, how they're being applied, and what customers are really looking for. I'm happy to share some of the main trends I've seen in recent years. 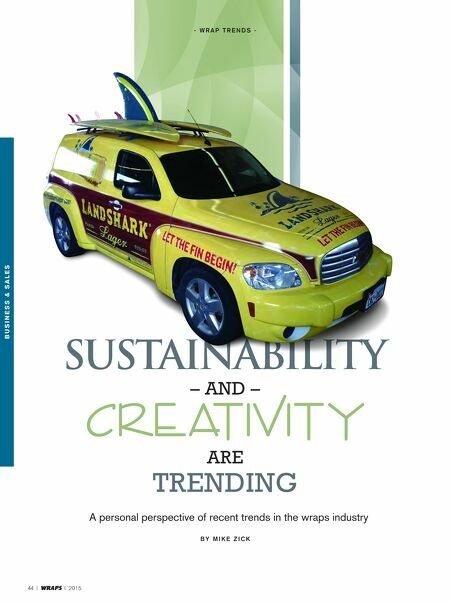 Focus on Sustainability For some customers, cost is the primary concern for a wrap project and no other features come into consideration. But in recent years, I have noticed a trend— typically led by larger companies— toward using materials that are more environmentally friendly. This approach requires a more nuanced view of the project's costs, because while the initial price is sometimes higher, if a material lasts longer or enables other savings it can be a money-saver in the end. I have found that it is the larger corporations that are more likely to have made this analysis, and they also often have corporate-wide goals related to sustainability. In the wraps world, we've been responding to this trend by recommending and using 3M Envision Wrap Films, which are made with more environmentally friendly materials. Many wrap films contain polyvinyl chloride (PVC), which is used to make them stable and durable, but 3M has invented a new wrap film that is more environmentally friendly and increases performance at the same time. 3M's new wrap films are non-PVC and phthalate-free, and are made partially from bio-based materials. They are also manufactured using less solvent—all of which make them a more sustainable, eco-friendlier choice. These films are becoming increasingly popular with customers who want to extend their environmental goals into their signage and branding. An Installer's Perspective From the installer's point of view, the push toward these films has benefits, too. While there are many products that require some tradeoff in performance in return for environmental benefits, that is not the case with 3M Envision Wrap Films. 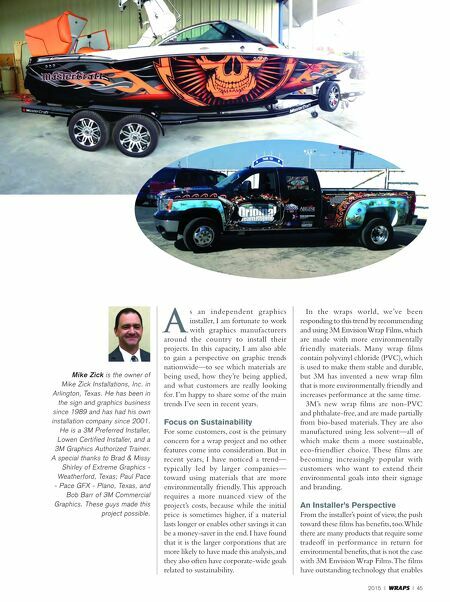 The films have outstanding technology that enables Mike Zick is the owner of Mike Zick Installations, Inc. in Arlington, Texas. He has been in the sign and graphics business since 1989 and has had his own installation company since 2001. He is a 3M Preferred Installer, Lowen Certified Installer, and a 3M Graphics Authorized Trainer. A special thanks to Brad & Missy Shirley of Extreme Graphics - Weatherford, Texas; Paul Pace - Pace GFX - Plano, Texas, and Bob Barr of 3M Commercial Graphics. These guys made this project possible.